A Real 'Gulf View'! Top Floor. Fantastic Private Beach! Our Gulfview II unit (Unit 309) is a wonderful property with a nice view of the water located across from the Gulf of Mexico on Old Highway 98. One of the best deals around, this cozy one bedroom is comfortably decorated featuring cathedral ceiling, private balcony, and is ready for a fun vacation. Gulfview is ideal for couples, small families, or the business traveler. Nice and affordable. Located on the complex's top floor (3rd). Area attractions and dining are just minutes away. Visit Silver Shells Outlet Mall and shop til you drop. Or, enjoy all your favorite foods from Boshamps, Captain Daves, Pompano Joes, Back Porch, Harbor Docks, Aj's, The Crab Trap, Outback, Chili's, TGIFridays, Red Lobster, and Cracker Barrel. Do not forget the evening entertainment and rule number one is have fun. I was born and raised in Tallahassee, FL, graduated from the U.S. Air Force Academy, served as an officer/pilot in the USAF for 9 years and then as a pilot with United Airlines for 5 years. I left the industry after 9/11 so I could spend more time with my wife and 3 sons. I'm the Broker/Owner of Armor Realty in Tallahassee and am licensed in both Florida and Georgia. I own this property with a friend of mine in Tallahassee. Although I'm a broker, this property is personally owned by my friend and I and is separate and independent from my real estate company. Our condo is AWESOME! It's quaint and comfortable. The beach is absolutely beautiful with its snow-white sand and clear blue water! 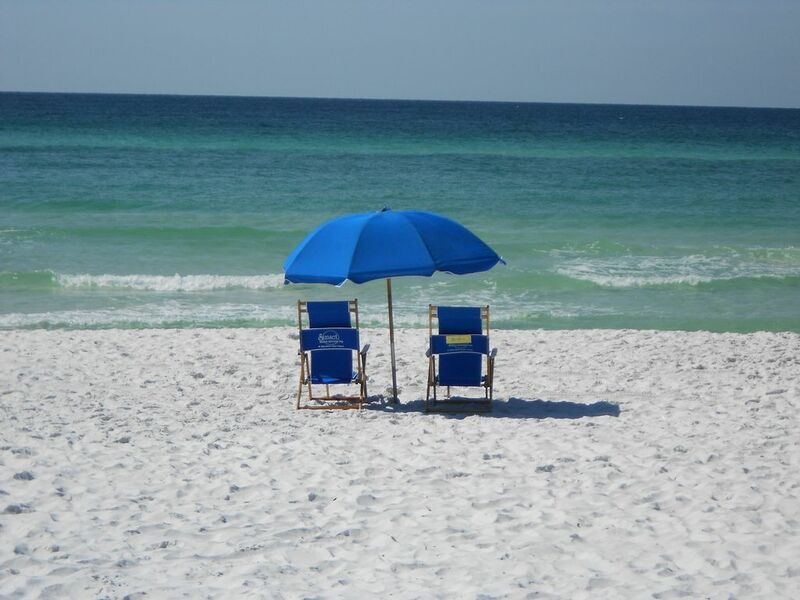 Beach access is incredibly easy and quick, unlike many properties along the Emerald Coast and 30A. The view from our balcony is GREAT, especially considering the rates we offer. Since there are no large high rise complexes nearby, the beach is much less crowded than other areas. You can walk to Pompano Joe's, Capt Dave's, Kenny D's for drinks and dinner/lunch! The Big Kahuna's water park, Bass Pro Shops, Outlet Stores, Marinas, Boat Rentals, Fishing Guides, Jet Skiing, Parasailing, Golfing, Bike Rentals, tons of other great restaurants, etc....are all close by--just a few minutes' drive. Gulf view, beach view, incredibly convenient and quick to beach. You'll be on the beach within 5 minutes of walking out our unit's door. Since there are no large complexes nearby, the beach is much less dense and crowded, meaning your beach chairs and umbrellas will be very close to the water, not 3 to 10 chairs deep like other locations. Also, since we are on the top floor (3rd), our unit is quieter than those on first and second floor since you will not hear the "pitter patter" of feet and furniture moving around above you. Additionally, since we are on the top floor and located near the end of the building closest to the beach, the view from our balcony is one of the best in the whole complex. One of best views in complex from our balcony as we are on top floor, and located toward end of building closest to beach. Included. Provided by condo association. Great location wish we were in the front unit though. When we arrived there was absolutely no toilet paper. We knew we would have to “buy some paper products,” but after a long drive, this was very disappointing. We were asked to start the dishwasher when we left, but we had to buy the dishwashing detergent. Neither tv worked, so we had to spend vacation time getting one of them working. We were unwilling to spend part of another day waiting for a technician to show up for the bedroom one. When we turned the kitchen spigot on cold, it leaked onto the counter. The inside of the microwave is rusted. There are few spoons, forks, etc. Loved the location. Condo was nice. I love the gulf view location. Our condo this time was nice but could use a little updating. Very clean, had everything that we needed. We’ve stayed at Gulfview for many years and love it there. Perfect location to our favorite restaurants and beach access! This condo was super clean and love the high ceiling layout of the third floor; made it feel larger! Mark was great to deal with, a few issues I have let him know about- so your stay will be 5 stars!!! Note: Until confirmed, rates are subject to change without notice. Smoking and/or pets not allowed. Must be at least 25 years old to rent.